Spot the difference? The Beocord 2400 replaced the Beocord 1900, and was not, as is sometimes suggested, a version to match the Beomaster 2400, the remote controlled version of the Beomaster 1900. Visual differences are few, an LED record indicator is fitted to the left of the left channel VU meter, though how this helps is not clear. A close look at the control keys at the left hand side of the control panel reveals another difference, the lower two keys were transposed and the tape type key was now labelled “metal”. Here lies the main functional difference and reason for the model change, by the end of 1980 any cassette deck that was going to be taken seriously needed to be metal compatible. In order not to have to change the panel design too much, and to keep operation simple, the switching between ferric and chrome tapes was now automatic, using the identifying holes on the rear of the cassette. Text copyright © Beocentral. Unauthorised reproduction prohibited. In use, the machine quickly showed another change (and welcome improvement); the VU meters worked on playback as well as recording, making it far easier to make accurate recordings with different brands of tape. Performance was a little better too, the upper frequency limit had been raised to 16KHz, an excellent figure for a machine in this class. A curious addition to the specification was the MPX filter, whose function was to prevent the 19KHz pilot tone from an FM stereo broadcast interfering with the action of the Dolby circuit. While this may have been necessary with some makes of receiver, the pilot tone suppression of Beomaster receivers has always been unusually good, and such circuits had not appeared on previous Beocords. The far more expensive Beocord 8000 range was also fitted with such filters, but in this case they could be bypassed with a switch on the bottom. Text copyright © Beocentral. Unauthorised reproduction prohibited. For a machine that differed so little externally, it was surprising to see how many changes had been made inside. The mechanism was altered little, except for a new type of air damper (of smaller dimensions) and the addition of the tape type sensing switch. However, the electronics were entirely new. Most interestingly, operational amplifiers were used in place of some of the bipolar transistorised stages of the Beocord 1900. These in turn required a regulated split supply, so this was added too, along with a different (and more complex) mains transformer. Another interesting point was the use of a miniature relay to switch the head connections for play and record. Both of these alterations followed Beocord 8000 practice, and form an excellent example of how the advanced technology of the top range models quickly spreads throughout the range. Text copyright © Beocentral. Unauthorised reproduction prohibited. Beocord 2400 was offered as the companion recorder for Beomaster 2300, and was withdrawn along with it in 1984. It was replaced by Beocord 1700, the last of the purely “mechanical” Beocords. 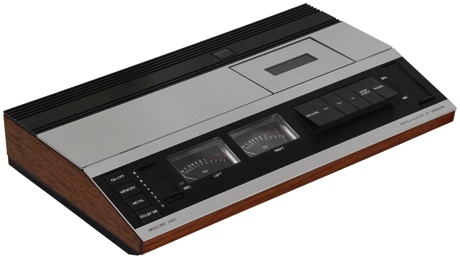 That was not the end though, when Beomaster 2000 appeared in 1985 and re-introduced the classic 1900 shape, there was also a tape recorder, the Beocord 2000. While this slim, wall mounted, touch sensitive machine shared no common parts, its basic shape and position in the range were the same. Text copyright © Beocentral. Unauthorised reproduction prohibited.